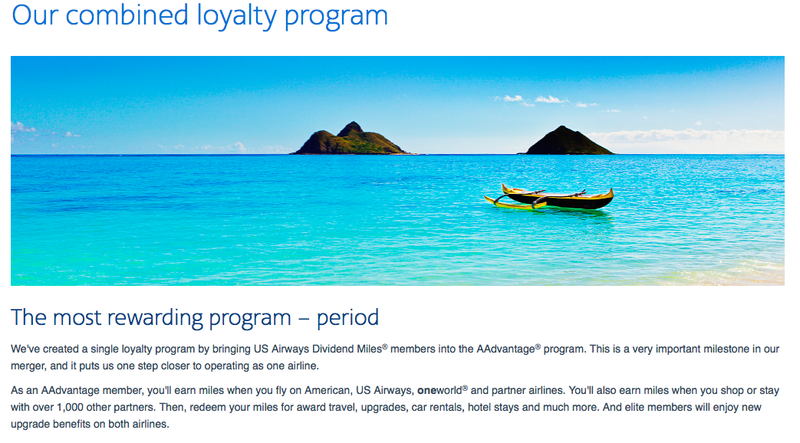 American AAdvantage is out with a new shopping/partner bonus that has the potential to be pretty lucrative. I received and email about the promotion but my understanding is that it's open to everyone. You do not need to register and you must complete purchases by 6/15/17. You can read the full terms of the offer here. I've already completed a transaction with 1-800 flowers for $40 earning including a $15 Amex offer. I also earned 900 AA miles given the current 30x bonus. All in, I will spend ~$100 and earn 6,225 AA miles. The miles easily wash out the cash outlay, essentially make the flowers, Saks merchandise, and a meal free. I wouldn't go out of my way to chase this bonus but it seems worth it for an extra 20-30 min over the next month. I've never had Elite status with American Airlines. In fact, I've only ever had status with USAirways (so I guess that's kind of AA) and United and maybe Frontier but that doesn't count. Yesterday, I received an email from American offering me a fast track to elite status. Seems like these offers are hitting and mine wasn't even the good one - American is offering straight up status to some that haven't flow on the airline much. While I doubt I'm going to meet the requirements, I registered anyway. My leisure trips are booked on United through June and my business travel will likely mean more trips on United or Delta. So I'm not going out of my way to take advantage of this offer but spending $2,000 and flying 12,500 in the next 3 months seems doable (for Platinum status) for many with consistent business travel. I'm sure there will be people that receive this challenge that just book a premium mileage run and achieve Executive Platinum but not me. Will post again if I'm able to make more advantage of the offer. Annual fees (waived for the firs year) on several credit cards in my "card box" were set to bill in January. I was hoping for retention bonuses on all three but only lucked out on one. I was able to cancel the other two cards via online chat in a combined 15 minutes. 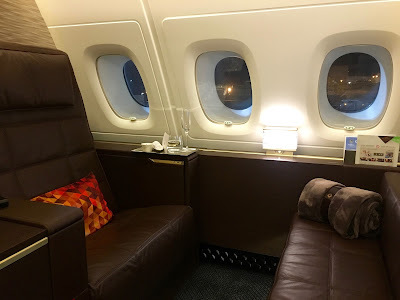 I called in to Barclays regarding the upcoming $89 fee on my American Airlines Advantage Aviator Red (fka US Airways Dividend Miles MasterCard). I was transfered to a retention specialist who quickly gave me two options. Downgrade to a no annual fee version of the card (far less benefits) or keep the card with another year fee-free. I chose option # 2 to take advantage of the card's offerings (10,000 mile rebate on awards, free checked bag, priority boarding, etc...) when flying/redeeming American Airlines miles. The call took all of 7 minutes and saved me $89 - although I wasn't going to pay that anyway. 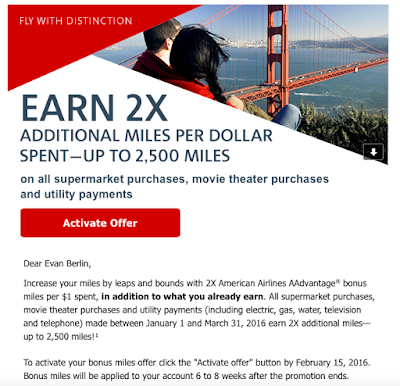 I was also targeted for a bonus that offers 2x additional miles on supermarket, movie theater, and utility payment purchases. I opted in and will absolutely be pre-paying my utility bill to take advantage of this offer. 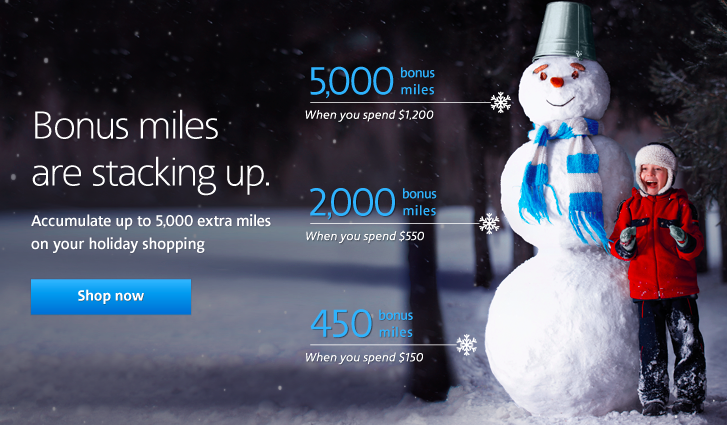 I'm reading the offer as 2x additional miles up to 2,500. 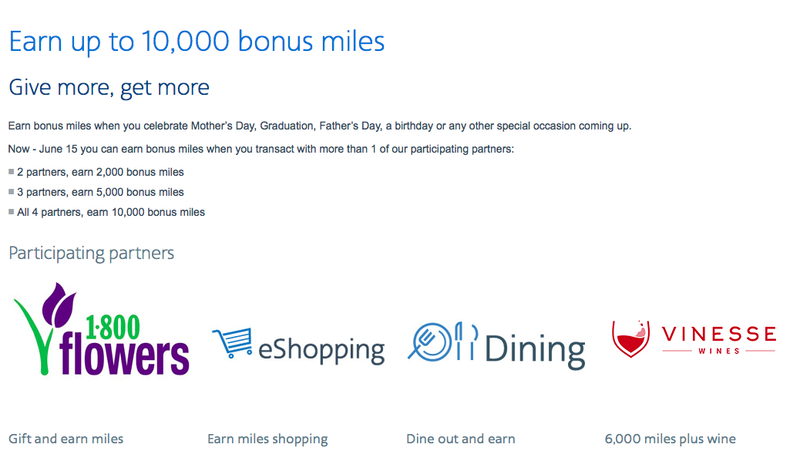 So I believe I can put $1,250 in spend on the card to earn 3,750 total miles which I value at $75. Barclays seems to be generous with retention bonuses (as well as other targeted earning bonuses) even without much spend on the card. It's always worth the 5-10 minutes to call in and ask about your options! American's shopping portal is now out with a lucrative holiday bonus offer. Not as good as the United offer but still pretty good if you're into AA miles. You get a couple of extra days with this offer (through 11/26 vs. 11/24) and the bonus thresholds differ slightly. The $450 spend threshold is the sweet spot on this offer at 4.4x. I've already started working towards the 3,000 miles United bonus so will continue to focus there as a I get a head start on my holiday shopping. They say the best part about a vacation is the anticipation. This trip is no exception. 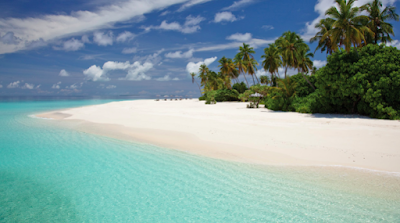 Emily and I have had The Maldives on our bucket list for years. For us flying halfway around the world to get to a beach is part of the fun. When the opportunity to spend time in The Maldives and Al Maha, (outside Dubai) I started to work on flights. Here's an overview of the booking process and what everything cost. We've already covered our first couple of nights in Dubai at Al Maha. This cost me 78,000 SPG points (normally 120,000) thanks to Starwood's recent promotion. Given the fact that the resort is all inclusive (3 meals per day and 2 activities) and room rates go for more than $1,500 USD/night, I consider this a great deal. 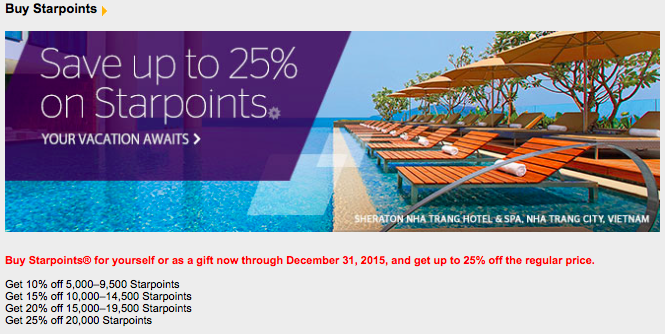 All in, I'm getting about 5 cents worth of value from my SPG points. Not that I would ever pay $2K for a night in a hotel but this regardless, this is one of the best redemptions of my life. We'll then head to the Park Hyatt Maldives for 4 nights using Hyatt Gold Passport points. The hotel used to be a category 6 then went to 7 and now is back to 6. So 25,000 points per night for a total of 100,000 for our stay. I used a combination of Hyatt points earned from stays and transferred in the rest from my Chase Ultimate Rewards account. I did pay cash to upgrade us to an overwater bungalow for the last night of our but I'll leave that out of the booking process since that was totally optional. The Advantage eShopping Mall is offering some pretty great deals at the moment. If you aren't familiar with online shopping portals, read this post first. Here's one of the best examples where you can literally quadruple dip on your earnings. Pretty unbelievable. For $155 in spend, you will receive $35 off so you'll actually spend $120. You will also earn 1,750 AA miles which I value at $35. 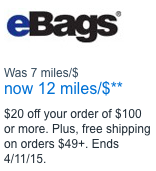 Plus 5% back from eBags gets you another $6 to use in the future. That is nearly 50% off your purchase!!! As you all know, American Airlines is in the process of integrating USAirways after their merger last year. There have been many milestones in combing the two companies and loyalty programs. 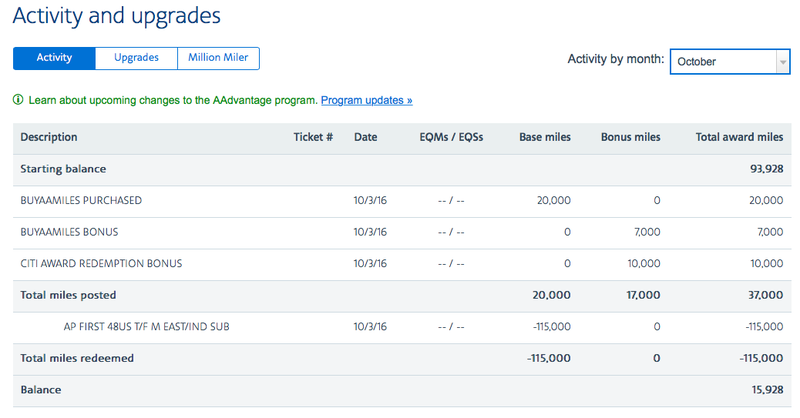 This weekend marks a pretty important milestone as USAirways Dividend Miles are being merged into American AAdvantage accounts. 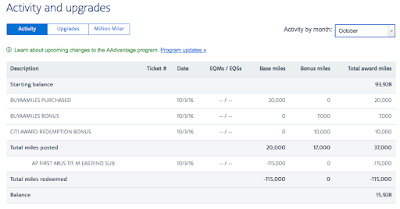 I logged into my AAdvantage account this morning and my USAirways Dividend Miles have been successful transferred! Same goes for Emily's account. I am still primarily a Star Alliance flyer given that I live in Denver and beyond United, my options are somewhat limited. But I've had great success earning and burning AAdvantage miles over the past year - especially to Asia. It's great to see that the migration went so smoothly and that all of my miles are now combined in one account. Congrats to the new American on what is obviously a huge milestone! A couple of days ago, I mentioned that I picked up the Barclays USAirways Dividend Miles MasterCard for the 50,000 USAirways miles that will soon become AA miles. All for only $89. When activating my card, I noticed this awesome promotion. I don't believe it's targeted (or else it's very widely targeted) as many others have received) it's possible that you might not receive the bonus on your account. You must agree to the terms to get the bonus and have until 6/30/15 to max out on the spend. 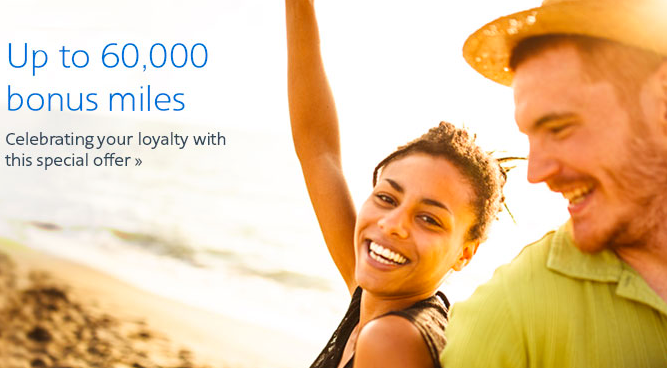 This offer is essentially providing 1.5x AA miles on up to $20,000 spend over a 4 month period. Pretty good for a non bonus category promotion. If you sign-up for the card today (remember it's going away in April) and spend $20,000 between now and 6/30/15, you'd earn a total of 80,000 AA miles for just $89 in fees. We're only 40 days away from our trip and we're pumped. Emily is always slightly bummed in the few days after Christmas (no more presents to open or family to hangout with) so it is great to have a trip to look forward to. In the scheme of things, this trip was relatively easy to book. There are three award tickets (two one-ways and a roundtrip) and three hotel stays. Not like our last trip where we had five hotel stays including two overnights and four flight segments to get to our first destination! If I had more time, we could make the itinerary MUCH more complicated but I still feel like we got great value from our hard earned miles and points. I've already dripped a couple of posts around our flight to Hong Kong and the return flight so figured I might as well write the first couple of posts since the holidays are coming up and things tend to get busy. Beyond that, we had a flood in our house a few days ago and while everyone is okay, our house is a mess. We were looking forward to this trip before but now we are REALLY looking forward to a week on the other side of the world. And writing about the trip gets me even more excited. Anyway..now on to the intro. We had originally planned a more robust trip to Asia where we could spend more time in each place and also see more places. For a variety of reasons, we had to rethink our itinerary so that we could be here for Christmas and return prior to the first week of January. That left us with 8-10 days to play with. We knew we wanted to go back to Hong Kong as it's easily one of our favorite places in the world. The combination (and juxtaposition) of cultures, sheer size of the city, and the setting make it a great place to visit. We'll be leaving for Hong Kong on the 26th of December which has special meaning for us - we took the same flight two years ago when we departed on our honeymoon and also got engaged on the 26th four years ago. Last time around we stayed on the Kowloon side at the W...this time we decided to mix it up and stay on Hong Kong Island at the Grand Hyatt. So we'll spend a few days in Hong Kong exploring before we head to Taipei for three nights. We are really excited about Taipei. It's just a quick hop (2 hours) from Hong Kong and from everything we've read, is a real gem of a city. We're staying at the W which is supposed to be one of the best of the W's. The location is perfect and we'll have a great view of the Taipei 101 (second tallest building in the world) New Year's celebration. 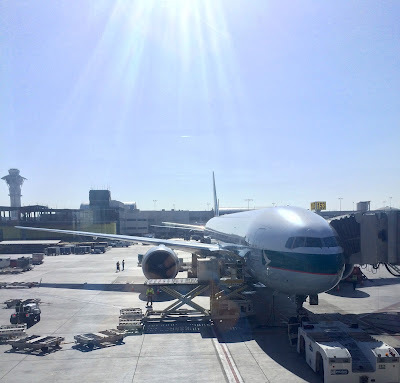 We then head back to Hong Kong for one night where we'll return to the W we stayed at in 2012 before heading home on American's 777-300ER direct to Dallas. Flying "legacy carrier" first class from the US to Asia was once the way to go. Not so much anymore with all of the competition from Cathay Pacific and Singapore Airlines among others. But it will be fun to ride in the nose of a 747 (I'm in seat 1K where the window faces slightly forward) and see what American has to offer on their brand new 777. And it will be fun to compare to our previous first class experiences. I'm most looking forward to the actual trip and getting there in style just makes it that much more fun. 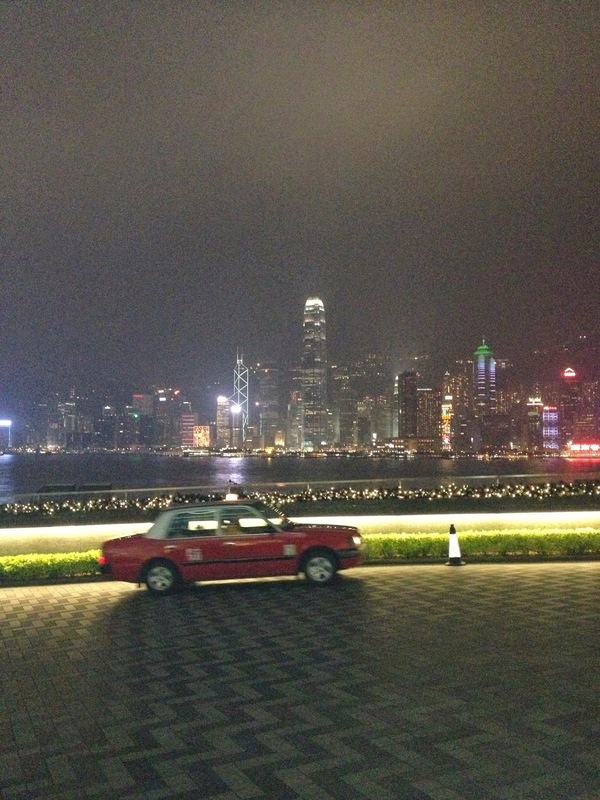 The entire trip was paid for with miles and points with the exception of our last night in Hong Kong. I'll have all the details on each redemption in the next post but I believe our total cash outlay (for flights and hotels) will end up being less than $600!